GROHE Minta Touch – cutting edge technology for a new level of kitchen convenience. 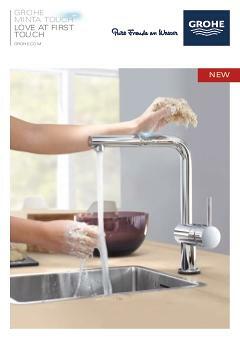 Don’t let messy hands while you’re cooking slow you down, with this touch-activated electronic tap. Simply touch the spout once with your wrist to start the water flow, and again to turn it off. GROHE’s innovative EasyTouch technology means you never need to leave dirty finger marks on your kitchen tap again, and the durable GROHE SuperSteel finish ensures your tap will always look like new. The Minta Touch single-lever mixer also features a high spout with 360° swivel range for increased flexibility, and the pull-down shower head with choice of two sprays makes prep, filling pots and cleaning the sink even easier. The SilkMove cartridge ensures smooth volume and temperature control and the SpeedClean mousseur nozzles mean you can wipe away limescale with ease. Minta Touch has been designed with sleek, modern lines that will give your kitchen a timeless style injection. This tap is top-mounted for easy fitting and features our Easy Installation System with clear instructions.